I love pork. It’s quite easily my favourite kind of meat. I can’t quite explain my proclivity to eating pig though. For some reason or other, more pork dishes appeal to me than those made with other meats. Some of my friends claim its a genetic thing, that we Chinese simply love eating pork. Whatever it is, I know that I could easily live without beef or lamb, and maybe even chicken. But there’s no way I could go on without a bit of pig in my diet. I like my pork so many different ways. I adore a good Chinese roasted pork belly; my favourite versions here in Singapore can be found at Hua Ting restaurant and The China Club. A good char siew is also hard to beat. The best I have had so far comes from Kay Lee Roast Meat Joint in Upper Payer Lebar, which I discovered via Kitchen Crazy Daffy. Another great place for pig is the very up-market Les Amis. Chef Gunther Hubrechson’s suckling pig is simply sensational. A rather greedy (but also gorgeous) friend of mine has been raving about it forever. I finally tried it 2 months ago when S and I celebrated our fifth anniversary there and we were blown away. It was easily the best dish of what was a pretty remarkable meal. Yanqing’s Shanghai Kitchen, on Bukit Timah Road, serves an excellent braised pork belly. Equally outstanding are the versions served at two of my favourite Japanese restaurants, Kandagawa, in the Hotel Royal, and Nirai Kanai, in Tanglin Shopping Center. A pork belly and mentaiko okonomiyaki from Nanjya Monjya makes for a pretty unbeatable late night supper. And I will never ever say no to a well-made katsu curry. While I think my wife’s is the best in town, when she won’t make it for me, I head over to Curry Favor on Stamford Road. Their pork katsu stuffed with cheese is artery-clogging but delicious. The wonderful thing with pork is its versatility. You can have it dressed up or stripped down. 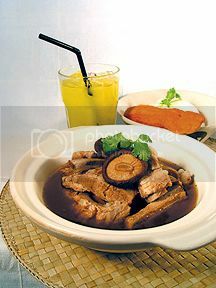 One of the simplest and most delicious ways to have it is in Bak Kut Teh. This pork-bone soup, when made properly, can be both refreshing and satisfying. I had previously written about my preferences for versions found in Penang. And while I still believe that the majority of Bak Kut Teh stalls here don’t measure up, the version served at The Simple Life, in Wheelock Place, is pretty darned good. (In fact, almost all of the local food that I’ve tasted there has impressed me.) OCBC cardmembers can take advantage of a special 10% discount when ordering the Bak Kut Teh. A great variation of pork bone soup can be had as part of a Kyushu Jangara Ramen, served at Tampopo, in Liang Court. Tampopo’s adjoining restaurant, Tomton, also serves some amazing katsu dishes. I really like that you can order normal, premium or ultra-premium (black pig) cuts there. One of my favourite restaurants in town, Sage, also serves some impressive pork dishes. In addition to having some pretty nifty a la carte items, as a favour to me, Chef Jusman So and his wife Kimberly Chew have agreed to create a special “Big on Pigs” menu for OCBC cardmembers. This three course dinner is literally a pork-fest. 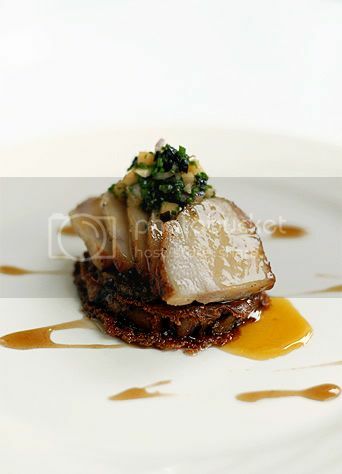 Start your dinner with caramelized terrine of pork offal with plum sorbet and a balsamic glaze. Then feast on a duo of pork: a medallion of braised pig trotter filled with lardons and sausage farçi topped with a homemade ravioli of egg yolk and Coppa ham, plated with a confit of Kurobuta pork loin with Catalan melon and prune salsa dressed with Armagnac and a reduction of Sherry. End the meal with a porky dessert, a bacon infused semifreddo topped with vine-ripened tomato jam and candied basil. The menu runs $50+++ and comes with coffee or tea. And, of course, you don’t have to eat pork only in restaurants. By all means, you should buy some fantastic pork products and cook up a storm. To help you fill your fridge with delicious piggy parts, we’ve arranged a 10% discount on all pork items at both the Great World City and Parkway Parade branches of Espirito Santo, the cool Brazilian butcher. Espirito Santo stocks an amazing selection of pork products. 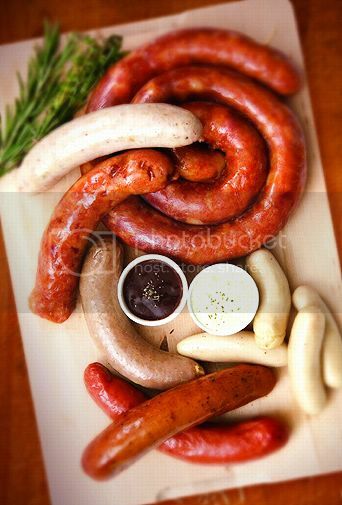 You can get everything from minced pork to tenderloin to freshly made sausages to pre-prepared pork schnitzel. Plus, they’ll even offer you some cooking tips and recipes. Phew, all this typing about pork has made me hungry. I think I’ll go make myself a BLT. The Simple Life: 10% discount on Bak Kut Teh, valid until 31 December 2006. Sage: 3 course Big on Pig menu priced at S$50+++, valid until 17 February 2007. Espirito Santo: 10% discount on all pork products at both Great World City and Parkway Parade locations, valid until 17 February 2007. Promotion is subject to Service Charge, prevailing Government Taxes and GST. General Terms & Conditions for all Dining Privileges apply. Payment must be made using OCBC Credit Card. These promotions are valid every day except eve of and on public holidays. For more details, visit www.ocbc.com. I’m pretty sure pig is the greatest food in the world. As long as it’s not a pork-flavored beverage it’s good with me. on one hand, i must say that your posts have been getting a little bit “corporate”; on the other hand, they *do* make me want to rush out to get my own ocbc card! btw, any ideas if the dining privileges extend to their debit cards? Pig is the thing. Pork belly is surprisingly popular here in London and we’ve had some great gastropub pig preparations lately. Love the blog. i too love pork! there is no other meat that pairs up with kimchi like pork. and then the versatility – cured hams, bacon, sausages. so good! OMG, I think I swooned with ecstasy sometime around the middle of the Big on Pig menu. Pork is just the best and so astonishingly versatile – from melting pork belly to crispy crackling on your roast to sticky char siu to sausages to Jamon Iberico – all perfectly heavenly!